Sarah has an M.S. and certification in Secondary English. She is a 2013 recipient of Dialogue's New Voices award for poetry. Her poems have been published in journals including Connecticut River Review, Fresh Ink, Star*Line, Noctua Review, Bacopa Literary Review, and included in the anthologies Fire in the Pasture and Dove Song. Her poem "Sepia Girl" was nominated for a Pushcart Prize. She also writes novels for young adults. Elizabeth graduated from Brigham Young University with a B.A. in English in 2007. In 2011 she received an M.A.R. in religion and literature from Yale Divinity School. While at Yale she enjoyed being a member of Inkwings, a group of fellow divinity school poets and artists, inspired by C.S. Lewis's Oxford literary group, Inklings. 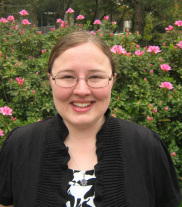 Her work has appeared in online publications, including Wilderness Interface Zone and Psaltery and Lyre, and in Dialogue: A Journal of Mormon Thought and Fire in the Pasture: Twenty-first Century Mormon Poets. She edited the book Habits of Being: Mormon Women's Material Culture, which was published by Exponent II. For all questions, please email youngravensliteraryreview@gmail.com. Please refer to the Submission Guidelines before submitting material. Photographs and artwork © Elizabeth Pinborough and Sarah Page.